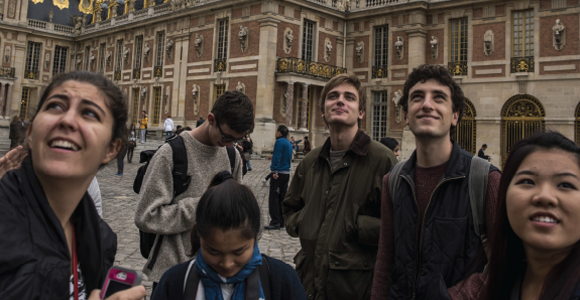 At the University’s Center in Paris, undergrads learn to see the world with different eyes. “Is it important to have a good lodge site?” Russell Tuttle wants to know. “Close to their last feeding spot,” says a woman in a gray University of Chicago hoodie. It’s mid-October, the second week of Tuttle’s three-week intensive course; like the other courses at the University’s Center in Paris, it meets for two and a half hours, four mornings a week. The students (who lodge at the Cité Internationale Universitaire de Paris, an international dorm complex a 25-minute tram ride away) sit around a long table in a small, spare seminar room. Among the room’s few accoutrements is a human skeleton. This weekend Tuttle’s students will have their own chance to observe chimps and other primates at close range. On Saturday Tuttle has scheduled a day trip to the Vallée des Singes (Valley of the Monkeys), a primate preserve in Romagne, 240 miles southwest of Paris. Despite the park’s name, its inhabitants include not just monkeys but gorillas, chimps, gibbons, bonobos, and lemurs. There are no cages. The theme of today’s class is “self-fashioning,” meaning the process of constructing your own identity and public persona. Of the 19 students in the room, at least half could be mistaken for students from the Université Paris Diderot, across the street from the Paris Center. The women wear minidresses or slim jeans with flats; one man keeps his scarf on throughout class. And while Desan has brought along a small china cup of espresso (the center has an espresso machine, bien sûr), several of the students have their own diminutive paper cups too. What Montaigne was trying to get at—and he’s the first to invent this term—is the condition humaine, the human condition. “He takes himself as a model,” says Desan. “His own self.” Montaigne rejects authority in favor of his own experience—and that, Desan says, is why he is still widely read, and translated and retranslated. After the break (Desan returns with a fresh espresso), he asks each student how they would describe the Essays. “It’s like reading somebody’s diary,” says one. Desan came to the University of Chicago in 1984, having studied sociology and political economy in France, taught in Japan (where he met his wife), then earned a doctorate in French literature at the University of California, Davis. In the 1980s, about 12 UChicago students studied abroad each year: “It all fit on one sheet of paper,” Desan says. “One year it was blue. One year it was yellow. One year it was pink.” There was no study abroad office; College adviser Lewis Fortner (now associate dean of students in the College) simply helped students who were very motivated figure out their own programs. By the mid-1990s, Desan had become master of the Humanities Collegiate Division, Boyer was dean of the College, and Desan had an idea for a civ program in situ. With support from Boyer and then-provost Geoffrey Stone, JD’71, the first faculty-taught civ course was held in 1996 in Tours, France. The first program to meet the Core civ reqirement was launched in Barcelona in 1997. By 2000 the College also offered civ programs in Athens, Rome, and Vienna. Around the same time, a group of faculty—including French literature professor Robert Morrissey, PhD’82, and Janel Mueller, then dean of the humanities—proposed establishing a permanent center in Paris. The University eventually chose a site in the formerly industrial 13th arrondissement, across the street from an abandoned grain mill. By fall 2003, the center, based on the ground floors of two neighboring apartment buildings, welcomed its first undergrads to do coursework in European civilization and French. (The students had to go in through a special entrance because the buildings weren’t finished.) The complex made its official debut the following spring. Now the 7,200-square-foot center—which expanded to the ground floor of a third neighboring building in 2005—hosts 250 undergrads each year, nearly half the total number who study abroad. More than 10 programs are offered, including African civilizations; astronomy; European civilization; Europe: east and west; mathematics; neurobiology; and primates and human evolution—all taught by UChicago faculty. Meanwhile, the mill across the street has been transformed into the Université Paris Diderot (Paris 7). Along with the Bibliothèque nationale de France, completed in 1996, the institutions form an academic corridor in the 13th arrondissement. Boyer compares the newly developed area, the site of a former railway, to Chicago’s South Loop. In the afternoon the students take French. No language background is required to apply for the program; half the students arrive in Paris with no knowledge of French at all. “Alors.” Xin Miao, AM’07, French instructor and student coordinator at the Paris Center, explains the function of this “stall word”—to give yourself time to think. One man has achieved a masterful command of alors, and therefore begins every conversation with it. “Une amie?” another objects when he’s introduced as a woman friend. Because ami begins with an “a,” Miao explains, it’s an exception to the gender rules when paired with my (usually ma and mon). Therefore mon amie and mon ami are pronounced identically—with resulting ambiguity about the gender of such a friend. “That could be dangerous,” a woman suggests. This week, which has the theme “France, slavery, and Africa,” readings include Robert Harms’s The Diligent (2002). Based on the recently discovered diary of a young lieutenant, Robert Durand, the book is a historical account of the first voyage of the eponymous French slave ship in 1731–32. The class begins with Picard’s presentation on the Middle Passage section of the book. She explains how Chevalier Des Marchais, another French slave ship captain, argued it was important to prevent rebellions by treating the captives well. This included not only reassuring them that white people weren’t cannibals (some of the captives believed they were eventually going to be eaten) but also employing an accordion player to perform on board. According to the historian Harms, “It’s difficult to know whether the screeching noises of the accordion were appealing to them, but they couldn’t have been worse than the bagpipes, which is what the English did,” Picard says. “Des Marchais says it would be better to use instruments from where they were from, because they probably would have liked it more.” The captives were also forced to attend dances on deck; meanwhile their quarters were checked for weapons. “What surprised you?” Osborn asks the class about The Diligent. “The finesse that went into it,” says a blond man: slave traders had to know everything from the political landscape of Africa to what kind of food the captives would eat. “I didn’t come to the study of France as a Francophile,” says history professor Paul Cheney, academic director of the Center in Paris for 2014–15. An economics and philosophy major in college, Cheney was interested in the transition between traditional economies and capitalism: “France is a fascinating case for historians.” He didn’t begin studying French until age 25. Cheney’s entire family is spending the year in Paris. His sons Nicholas, 11, and Louis, 8, who spoke only English as of last summer, are enrolled in a French public school (“They are really, really tired at night,” he says). His wife, Jessie, a high school teacher on leave from her job, is studying French at the Sorbonne. At the end of the fall quarter, Osborn and anthropology professor François Richard are scheduled to lead one final excursion for their African civ students: a weeklong trip to Dakar, Senegal. The optional capstone experience, free for the students, was funded by a grant from the Women’s Board. Whether UChicago students study abroad for a quarter or a year, they often return with “this really deep guilt that they didn’t do more,” says Martha Merritt, deputy dean in the College. Merritt, the former director of study abroad, coteaches a popular course, The Ugly American Comes Home, that parses the study abroad experience. In spite of (or perhaps because of) such awkward moments, it’s a “trope of study abroad,” says Merritt, “and it’s a trope because it’s true, that students return with fresh eyes.” Students who have been to Paris or Beijing or Pune see the world in a different way, whether or not—as Montaigne would argue—they are more wise. Russell Tuttle, professor of anthropology, evolutionary biology, and the history of science and medicine, won a Quantrell Award for teaching in 2006. His most recent book, Apes and Human Evoution, was praised by one reviewer as “a magisterial synthesis.” Read more about Tuttle’s book in the University of Chicago Magazine. Philippe Desan, Howard L. Willett Professor in Romance Languages and Literature and the History of Culture, serves as the general editor of the journal Montaigne Studies. His honors include Chevalier dans l’Ordre des Arts et Lettres (2011) and Prix de l’Académie Française (for the Dictionnaire de Montaigne, 2005). Read more about Desan’s Montaigne class in the University of Chicago Magazine. Emily Lynn Osborn, associate professor of history, is the author of Our New Husbands Are Here: Households, Gender, and Politics in a West African State from the Slave Trade to Colonial Rule (2011), which focuses on Kankan, Guinea-Conakry, West Africa. Her current book project, Recycling Traditions: Aluminum Casting and the Making of a Modern African Diaspora, is a social and cultural history of technology transfer. Read more about Osborn’s research in Dialogo.